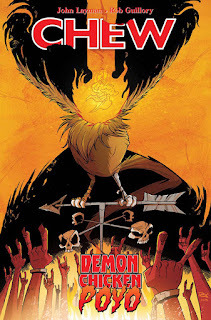 John Layman and Rob Guillory know that a demonic chicken with fighting capabilities will haunt your dreams. That doesn't mean said character doesn't deserve a proper sendoff and that's what the duo is doing this April in Demon Chicken Poyo. Hell wants him. Heaven won’t take him. Earth needs him. That was also the tagline for that godawful Constantine movie. But Poyo is so badass, he stole it from Keanu Reeves! Chew: Demon Chicken Poyo #1 cover A by Guillory (Diamond code: FEB160499) hits stores Wednesday, April 20th. Chew: Demon Chicken Poyo #1 Cover B sketch variant (Diamond code: FEB160500) will also be available Wednesday, April 20th. Final order cutoff deadline for retailers is Monday, March 28th. Full press release below.